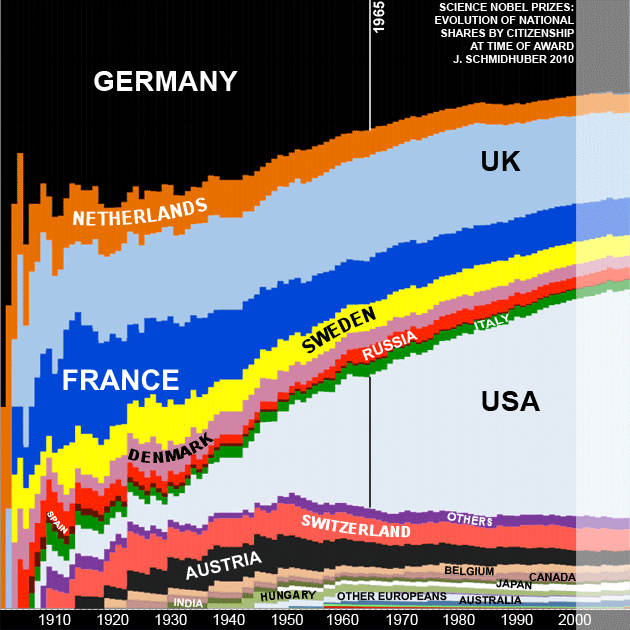 Figure 13: Science Nobel Prizes 1901-2009: Evolution of cumulative national shares by citizenship at the time of the award. Countries are ordered from upper left to lower right corner by the year their first laureate received a Nobel Prize fraction. The vertical width of a nation's colored band at each year measures its percentage of all Nobel Prizes in the sciences (physics, chemistry, medicine) up to that year (image height = 100%). Germany led from 1901-1964 (sharing the lead with the UK for one year 1904-05). Then the US took over. Note the differences to the birth-based ranking, reflecting brain drain to the US (and also the UK). From Evolution of National Nobel Prize Shares in the 20th Century, Jürgen Schmidhuber, 2010. PDF. HTML.